The public traffic throught the new part of the Kotorosl Bridge was reopened. On Wednesday public transport started to use the rebuild part of the viaduct. It was only a half of the task. On Wednesday morning the the public traffic started to flow through the new part of the bridge across the river Kotorosl. We would remind you that to not to break the connection between the southern and the northern parts of the city, it was decided to divide the reconstruction into two steps. And while the one half was being rebuilt, the another one has been used. And now they switch the roles. One of the reconstruction program discussed was to close all of the traffic for a while. Fortunately, local authorities denied this plan. However, the new part of the bridge is not renewed completely yet. There is no asphalt there and so on. But the authorities claim that it is safe. The really good news is that that two-way traffic restarted on the bridge. Instead of reverse traffic, what we have had for several months. There are also some marked shifts in the second bridge construction. Both bridges are supposed to be ready to The Yaroslavl thousand anniversary. Friday, March 12, 2010 in News. You can comment (we have one response). 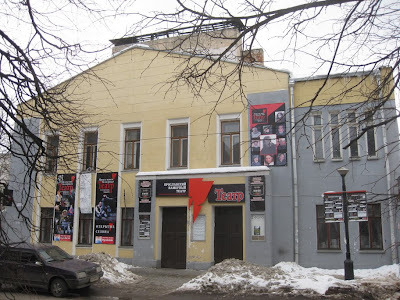 We are in front of the building known for most of Yaroslavl citizens as Ars-Cinema. 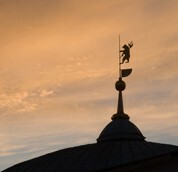 The cinema rested in peace in 1994 and now there are “Ars-Forum” and Yaroslavl Chamber Theatre there. However, the original mission of the building was far from arts. It was built in 1913 as House Of Mutual Help For Private Official Labour. The meaning of the title is rather simple. It was a combination of special interests club and special helpdesk for so-called “small business”. It is said the building has never played such role. Because during The World War I there was a hospital there. And the Ars-Cinema was arranged there almost immediately after the Revolution. Tuesday, March 02, 2010 in Story. You can comment.